A garden can never have too much vertical accent. 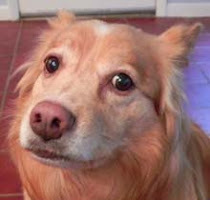 Well perhaps, but not my garden. It's why I'm in love with Eucomis, aka "pineapple lily.' I'm not certain when I fell for this tender plant, but I've ordered a few to add to the one that I've successfully gotten to regrow from a bulb in a pot from a supermarket. Supermarkets have the honor of offering a first taste of horticulture to budding gardeners. The three stores I frequent all have been beefing up their offerings in their floral departments. I'm not certain where the three plants I've purchased over the winter were grown. Ideally, the Ornithogalum, Orchid and Eucomis come from Florida, California or Texas, but more likely were from South America, the Netherlands or even Africa. 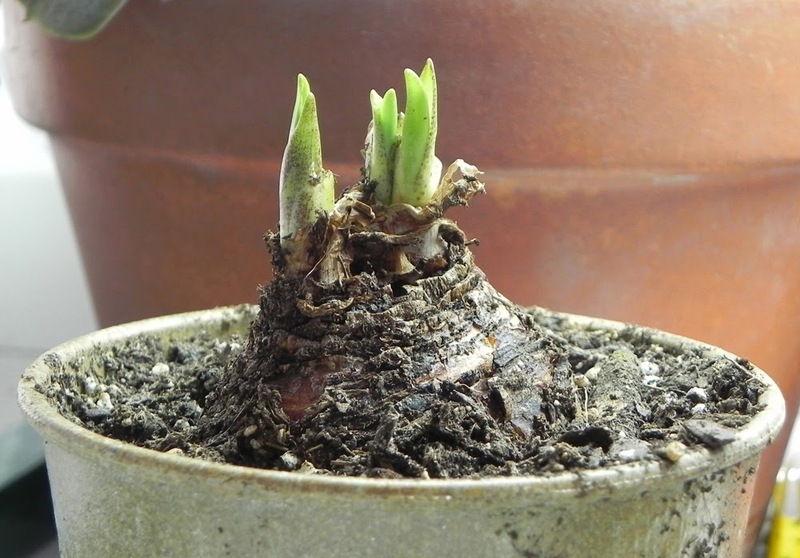 The Eucomis I purchased was a sale plant, several weeks past its prime but with several bulbs crammed into an eight-inch pot. I watered it until the leaves were dried up and then let the soil dry out before cutting off the foliage and putting the pot on the floor in my garage inside a Styrofoam container with no lid. It hung out there for a couple of months. I popped the bulbs out of the pot in mid-February and potted up the two largest ones separately into small pots. Around three weeks later the larger of the two bulbs started growing! 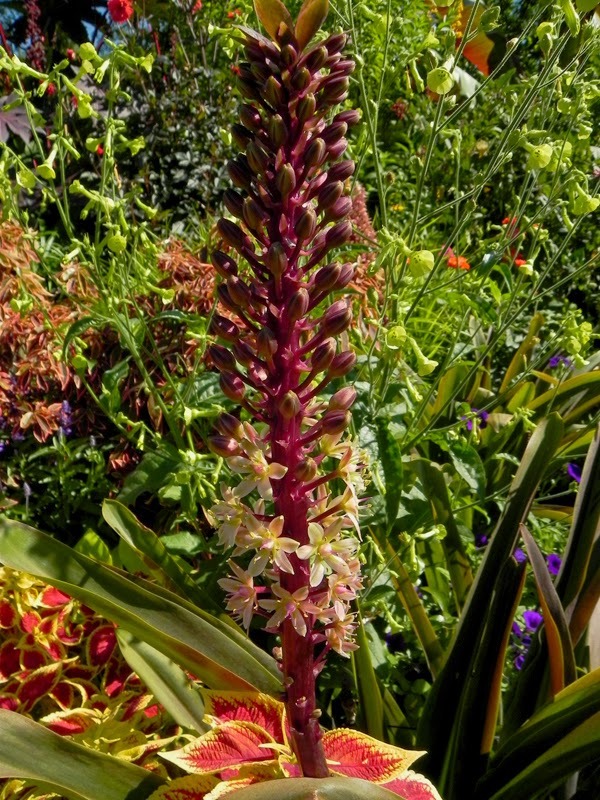 Eucomis 'Oakhurst' beginning to open July 24 in Barbara's garden. 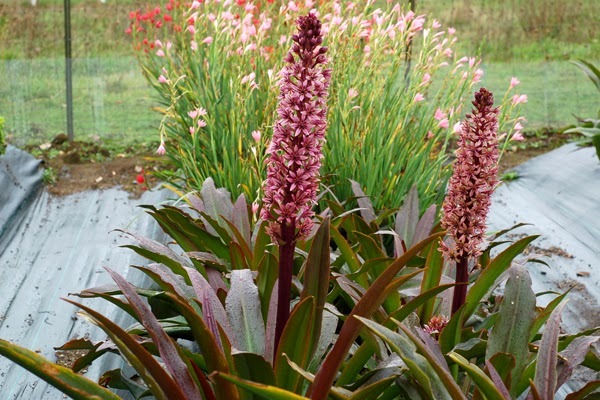 My excitement about this plant was underscored and I was duly inspired when I visited a private garden in southwest Michigan that utilized Eucomis along with dozens of tropicals planted among just as many hardy plants. The variety that Barbara, the garden's owner, plants in her tropical border is 'Oakhurst', and she especially loves the plant's longevity in what can be a brutal summer climate. The only drawback, Barbara tells me, is their need for support, which she provides invisibly with a combination of upright stakes and twine. The leaves of Eucomis are broad and somewhat succulent. Once they begin to flop, they'll take the flower spike down with them. 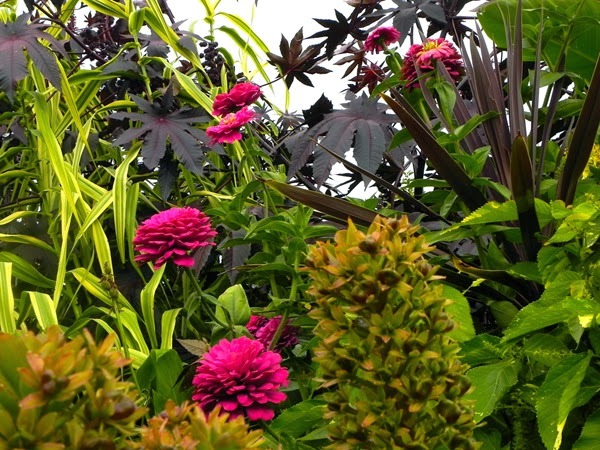 Barbara likes to combine Eucomis 'Oakhurst' with Phormium, castor bean, coleus, Zinnia, and Nicotiana. Eucomis 'Oakhurst' in foreground September 18 in Barbara's garden. In addition to the unknown variety I'm nursing back to life, I've ordered Eucomis pole-evansii and 'Toffee' from Digging Dog Nursery. Terra Nova Nurseries has some new varieties on offer, one of which is said to be an improvement on 'Oakhurst', with a more upright habit. 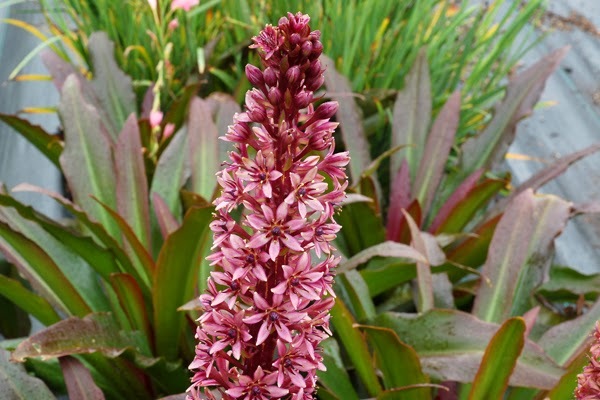 Eucomis 'Zulu Flame' is a dwarf pineapple lily, the result of a cross between two Eucomis species. 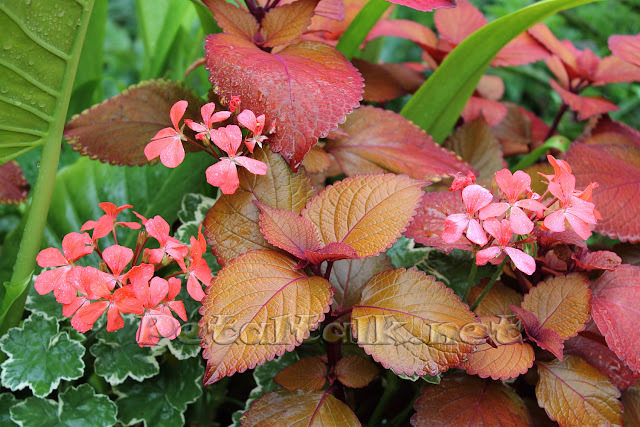 'Zulu Flame' is new this year, so you might want to ask your garden center about getting it in.